Thereâs nothing left to do but move in to this meticulously maintained, brick ranch! 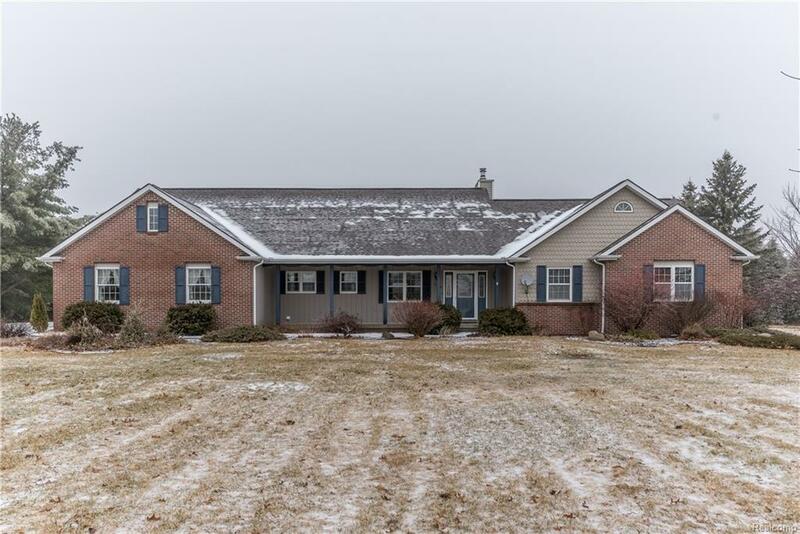 This home sits on nearly 4 private acres and backs to a 30 acre tree farm with an amazing 64x60 pole barn, provides the perfect country setting and is a short drive away from dining and shopping. Youâll love this open and light-filled home. Youâre welcomed in to the family room that boasts a wood burning fireplace and gorgeous views of the property, the kitchen has been updated with granite counters, new ss appliances and a breakfast nook with a slider to the covered patio. There are 3 spacious bedrooms and 2.5 baths including a master with a doorwall to the patio, a wic and an en suite. Thereâs a convenient main floor laundry with new W&D, an attached 2.5 car garage, and a large basement. The home has fresh paint throughout as well as new carpet. Outside, the pole barn has a custom built workshop, new garage door openers, water line, septic system and 110 and 220 service already run.